WCCLS is happy to announce that you can now apply online for an E-Access library card! What can you do with an E-Access card? 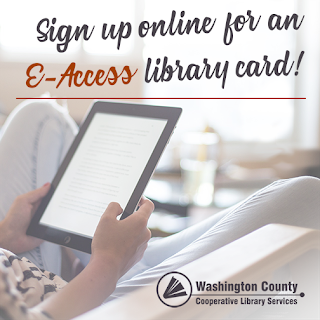 Online registration is currently open to Washington County residents who do not currently have a WCCLS library card. If you already have a WCCLS library card, you currently have access to everything listed above! To check out or place holds on physical items, please visit your library to get a different kind of library card. Celebrate National Library Card Sign-up Month by applying for a card today!